Owner, Pearl McGinn is an “animal person” with many years of experience with a variety of animals. She is a long time Labrador Retriever breeder with the Canadian Kennel Club (CKC) and current President of Canadian National Master Retriever Club. 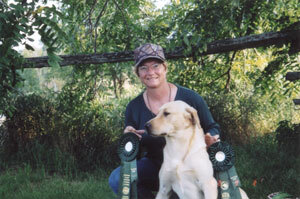 Pearl has handled several of her dogs in field trials and hunt tests at all levels. She is a qualified CKC hunt test judge for all levels up to and including National Master and has judged across the country. Our facility is heated and air conditioned. 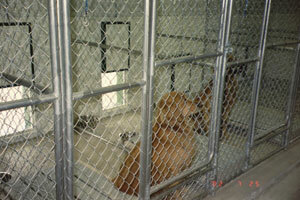 We have 14 kennels, all of which have inside and outside runs. All the outside runs are also sheltered under a roof so that your pet may enjoy the outdoors but not the inclement weather. We also have a spacious excercise yard for those who want to romp around off leash. Each dog in the kennel receives a minimum of two daily leash walks through the fields on our 125 acre farm. The focus of our staff is to make certain that your pet has an enjoyable and stress-free stay with us. Many pets suffer from stress when separated from their families so every effort is made to ensure that they do not suffer any additional stress or anxiety. Each pet receives personalized, one-on-one care daily. As a retired Pet First Aid Instructor, Pearl will provide the best care for your dog in the event of an emergency. It is essential to know what to do until veterinary care can be accessed.